eTurns provides distributors real-time visibility into their customers’ remote storeroom inventories and then automates replenishment using iPhones/Androids, scanners, eVMI sensors or RFID. Whether inventory is consigned or customer-owned, managed by the vendor or the customer, eTurns optimizes inventory and maximizes service levels while reducing procurement costs by up to 90 percent. eTurns serves some of the top industrial distributors including Graybar, Anixter, Gexpro, Rexel, and Arrow Electronics. In addition, eTurns provides local and regional distributors the ability to compete with the top-tier distributors – eTurns can be the value-added inventory management service they offer their customers. Most distributors using eTurns have found it helps them increase same-customer revenue by an average of 20 percent. eTurns has four SaaS offerings with increasing degrees of automation and ROI: iPhone replenishment, full inventory management using scanners, inventory management with RFID tags, and eVMI sensor-managed inventory. All the solutions can be integrated with any ERP software. eTurns is a privately held company based in Irvine, CA. Rexel uses the eTurns iPhone Replenishment Solution. Rexel’s reps (VMI) and customers (CMI) walk around the storeroom floor scanning barcodes with an iPhone that has the eTurns app. They scan, enter item quantity and click send. The order is sent to eTurns and then to the distributor. Parts are picked, packed and shipped. eTurns iPhone Replenishment Benefits: no order entry mistakes, no double entry of item numbers, simple interface and quick process. Graybar uses the eTurns Remote Storeroom Inventory Management Solution with scanners. eTurns Remote Storeroom Inventory Management Benefits: eTurns reviews and optimizes inventory, helping maximize service levels by trending min/max based on actual usage. When parts fall below a minimum, a reorder is triggered. Inventory can be allocated to projects or staging. Gexpro Services uses eTurns RFID Inventory Management. When their customers empty a bin of parts, the customer passes the bin past the RFID tower which creates an order. Gexpro Services picks, packs and ships. The customer places the new material in the bin and places it back on the rack. 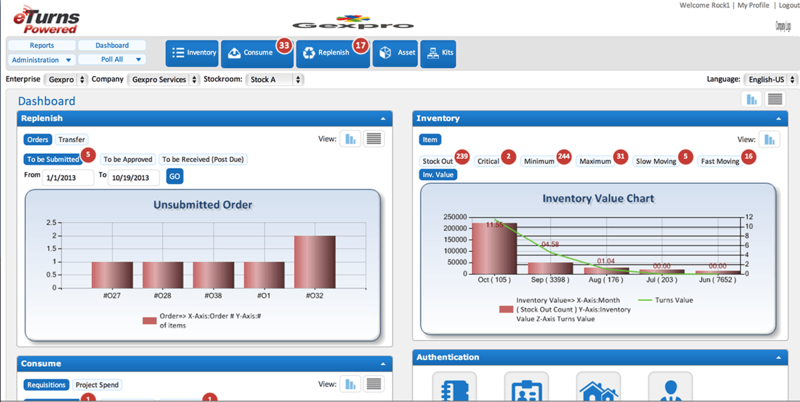 Gexpro Services also uses eVMI Sensor-based Inventory Management in their customers’ storerooms. eTurns puts eVMI sensors under bins of parts on a mobile cart or stationary rack. The sensor measures the weight of each bin twice a day. When quantity falls below a minimum, a replenishment order up to the maximum is sent through eTurns to the distributor’s ERP system. eTurns RFID Inventory Management Benefits: no order entry mistakes, no manual labor needed to count or order more parts. eVMI Sensor-based Inventory Management Benefits: eVMI performs a complete physical inventory twice a day with no human intervention. We recommend eTurns to anyone looking for cloud-based inventory management systems, especially those also needing to manage maintenance and work orders for their assets and/or equipment. Not sure if eTurns is the right solution for your business? Call, click, or email to speak with an unbiased Technology Advisor for a no-cost, no-obligation consultation on your unique requirements. Learn everything you need to know about eTurns. Our experts will reach out to you shortly.